8 soldiers, one officer and 2 Airmen of the Nigerian Air force were killed in an attack by gunrunners and bandits in Bosso Local Government Area of Niger State. 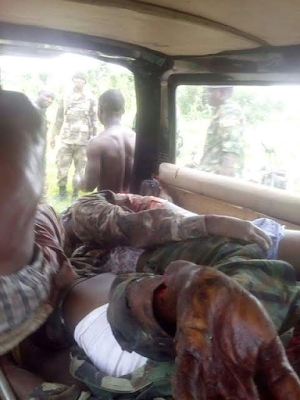 The troops also killed 8 of the armed bandits and arrested 57 others. 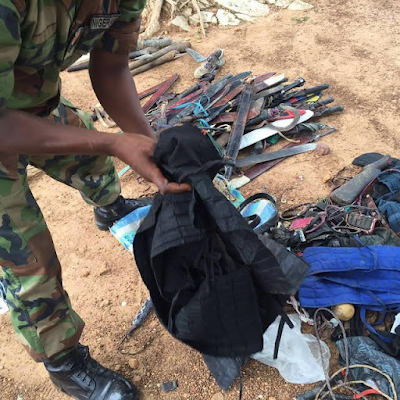 They also recovered large quantity of arms and ammunition. Director of Army Public Relations, Col. Sani Usman, who confirmed the attack said that following covert surveillance and intelligence reports on the activities of some gun runners and armed bandits in Kopa, Dagma and Gagaw villages in Boss LGA, troops of 31 Artillery Brigade, 1 Division Nigerian Army in conjunction with Nigeria Air Force detachment on Internal Security Operation MESA went on quick cordon and search in the affected areas to recover suspected weapon cache and arrest the suspected persons and the armed bandits. "Contrary to statements attributed to some questionable vested interests, the troops were on legitimate official duty aimed at safeguarding lives and property of citizen in the area. While approaching and deploying to carry out their lawful duty, the troops came under simultaneous and sporadic shootings in all the three locations. They however responded as necessary in line with the rules of engagement. Sadly, an officer and 8 soldiers of the Nigerian Army and 2 Airmen of the Nigeria Air Force lost their lives in the line of national duty. 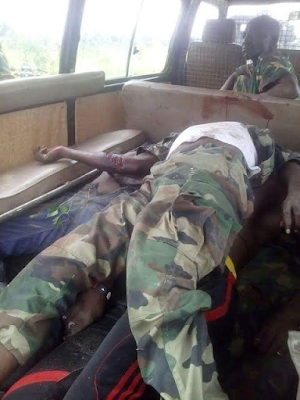 Additionally, one soldier is still missing while 2 of their colleagues were seriously wounded. 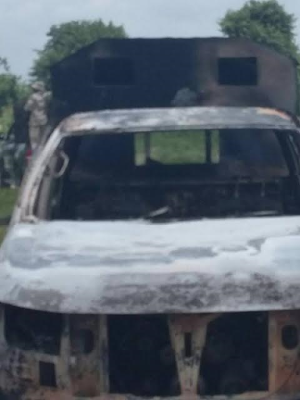 The suspected gun runners and armed bandits also burnt down 4 operational vehicles and vandalized 2 others. 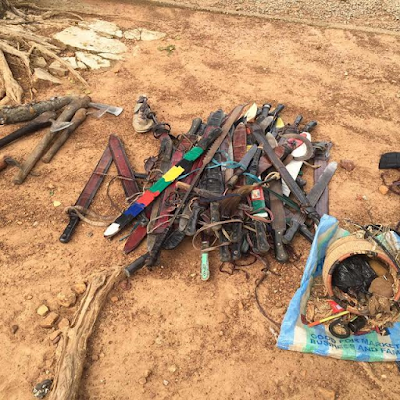 Bandits also carted away 4 AK-47 rifles and one Fabrique Nationale (FN) rifle belonging to the deceased soldiers. 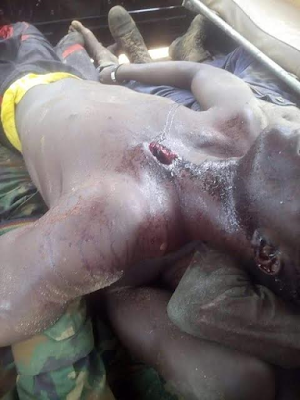 The troops also killed 8 of the armed bandits and arrested 57 others. 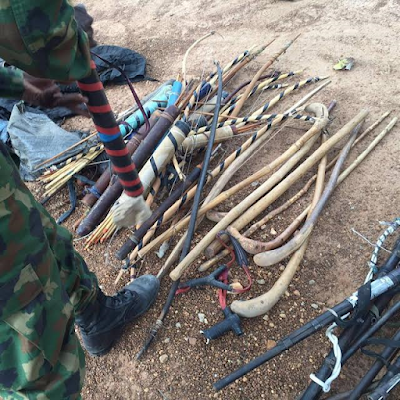 They also recovered large quantity of arms and ammunition. The recovered items include; 3 AK-47 rifles,10 Local AK-47 Rifles, 9 Locally made Pistols, 6 Revolver guns, which fires 7.62mm (Special ammunition), 45 Loaded Dane guns, 10 Clubs and Cudgels, 41 Arrows, 18 Bow cases, 122 Cutlasses and Machetes as well as 20 Daggers. Other items recovered include 31 Axes, 63 rounds of 7.62 (Special) Ammunition, 10 Bajaj Motorcycles, Assorted Charms and Amulets, 2 Vehicles, 38 mobile telephone handsets, a wristwatch, 5 Identity Cards, Passport Photographs, Cash sum of N23,870.00k, 5 Japanese Yen and 35 different denominations of old Nigerian currency, 15 Catapults, 8 Torchlights, 2 Gun Powder bottles, 4 empty cases of Ammunition and 41 Cartridges. The troops also seized a military Waist Belt and a pair of military Combat Boots. 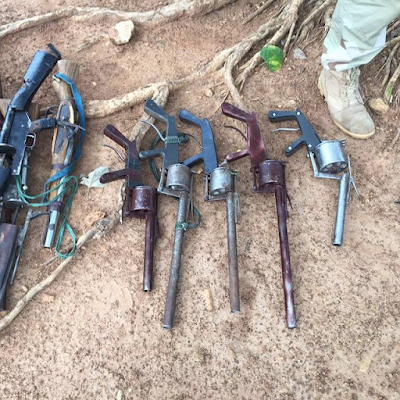 It is important to stress that the nefarious activities of the gun runners and the armed bandits has direct bearing with the influx of weapons and general insecurity in some parts of the Federal Capital Territory and the North West geo-political zone of the country. 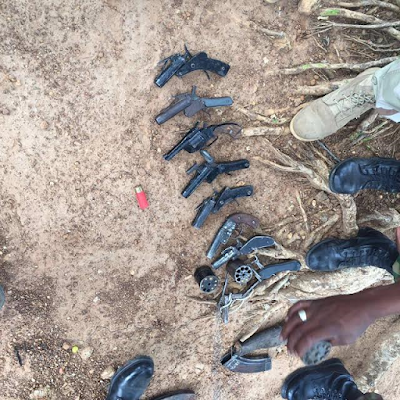 The same gun runners have been confirmed to be the suppliers of arms to armed robbery gangs that were involved in series of armed robbery attacks along Minna-Bida road and the general environment. Although the situation is under control, the military will not rest on its oars until all those involved are arrested and brought to justice. The military will continue to deal with any violent threat to our national security. The Army urge all law abiding citizens to go about their lawful duties as the cordon and search operation continues in the general area and if necessary expand to other identified areas to keep our people safe.